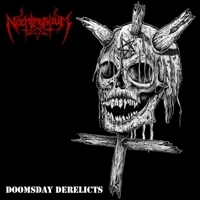 The new EP, Doomsday Derelicts, recorded in Steve Albini (Nirvana...) 's studio, is in a lot of ways Nachtmystium's most extreme release in years. A more oldschool aspect has been brought forth, thus letting out the mood sporadically present on Assassins: Black Meddle Part I from 2008. The EP is easier in its expression than the earlier releases, but still with the US touch that has made Nachtmystium's sound recognisable. They mark with Doomsday Derelicts a return to their sources. Check out the last track especially, "Hellish Overdose", that gives a great 80's speed metal feeling, reminding of Metallica's Whiplash. Enjoyable record but now that some time has passed since I reviewed Nachtmystium's last album, I think I might have been slightly too mild towards them. One gets enough og the music after a while. Maybe reinventing the 80's would be a way to go further? I'd surely like to hear more of it in the future.